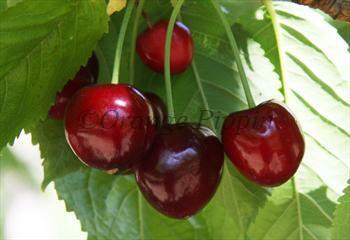 A large black / red early-season cherry with a good flavour. Merchant is in flowering group 3. Merchant is self-sterile and needs to be pollinated by another tree of a different variety nearby. Since it flowers in the middle of the blossom season it can be pollinated by most other cherry trees. Merchant is a precocious variety and is likely to start fruiting on the Gisela 5 rootstock at about 3 years. It is not self-fertile but can be pollinated by most self-fertile cherries including Stella, Summer Sun and Sunburst. Other pollinators include Merton Glory and Noir de Guben. Merchant was developed at the John Innes Centre, in Norwich, UK in 1970s. Other varieties developed here include Colney and Summer Sun.